This is article 7 in the sequence entitled Fields and Particles: with Math. Here is the previous article. The previous article described what fields are — objects that have a value at each point in space and each moment in time [i.e., “functions” of space and time] that satisfy an equation of motion, and are physically meaningful in that they can carry energy from place to place and actually affect physical processes in the universe. So at least for now, we’re going to think of certain relativistic fields as elementary physical objects in the universe, not as particular properties of some as-yet unknown medium. Whether that’s the viewpoint that physicists adopt over the long term is a question for… well… the long term. See here for an ongoing discussion about the issue. As we saw in a previous article, it turns out that μ is the minimum frequency for waves in this field, and we’re going to rename it νmin for the remainder of this article. Note the universal speed limit is often called “the speed of light” for the following reason: Waves with a Class 0 equation all travel at speed cw; and light (the general term meaning electromagnetic waves of all possible frequencies, not just visible light) traveling through empty space satisfies the relativistic Class 0 equation, so light waves (and the waves of any relativistic field satisfying the relativistic Class 0 equation) move at the speed c.
That’s a triangle that’s gotten so squashed that it’s just a horizontal line, see Figure 1 at right. In this case the minimum frequency is zero; you can make the field oscillate as slowly as you like. Fig. 1: A Class 1 field has waves that satisfy a Pythagorean relation among minimum frequency, inverse wavelength, and frequency, as shown by the triangle at left. The frequency equals the minimum frequency when the wavelength is infinite (c/λ → 0); this is shown at bottom. 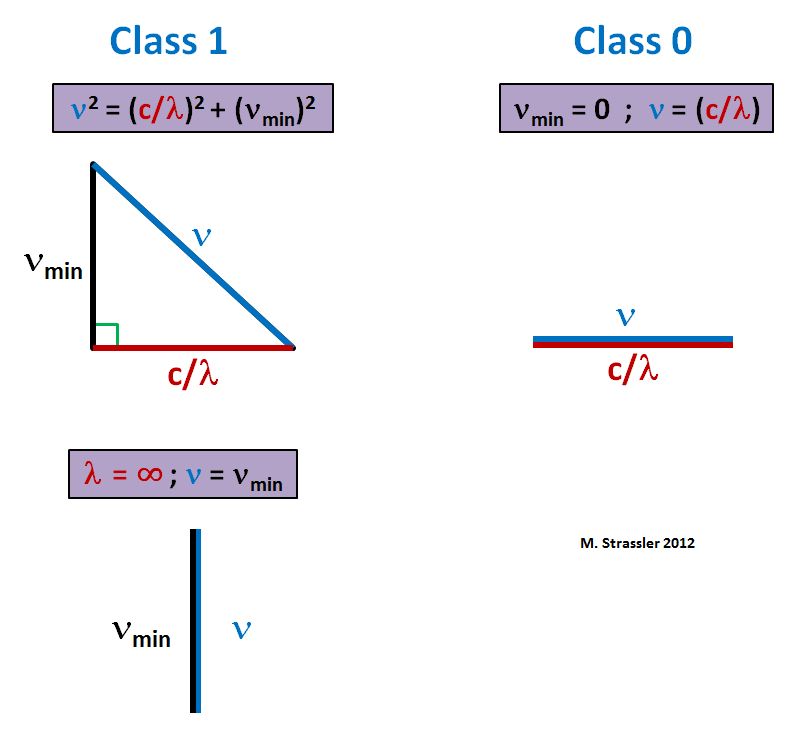 Class 0 is like Class 1 with minimum frequency taken equal to zero, as shown at right. Notice there is no constraint on A. But that’s because we’re ignoring quantum mechanics. It’s time to study relativistic quantum fields. This relation was first suggested, for light waves specifically, by Einstein, in 1905, in his proposed explanation of the photo-electric effect. Fig. 2: A Class 1 field has quanta that satisfy a Pythagorean relation among minimum energy (mc²), momentum (times c) and energy, as shown by the triangle at left. The energy equals the minimum energy when the momentum is zero; this is shown at bottom. 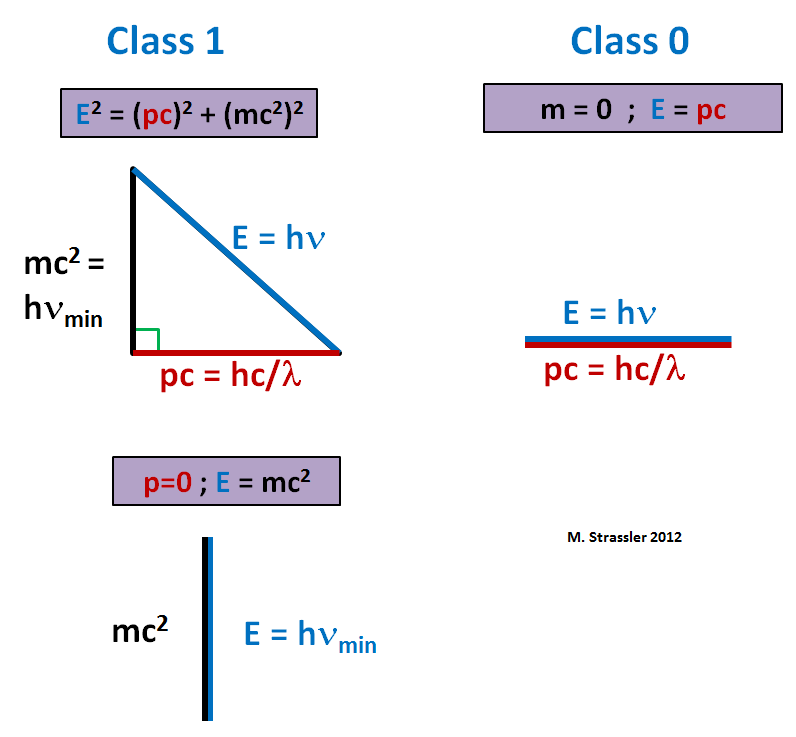 Class 0 is like Class 1 with minimum energy (i.e., mass) taken equal to zero, as shown at right. Compare with Figure 1.
which is Einstein’s relation for massless particles. The quanta of electromagnetic waves (including all forms of light: visible light, ultraviolet light, infrared light, radio waves, gamma rays, etc., which differ only in their frequency and thus in their energy per quantum) are indeed, once we apply the two red equations above, massless particles. These are photons. From the second red equation above, we can finally see what the mass of a particle is. Each particle that has a mass is a quantum of a Class 1 field whose waves have a minimum frequency νmin; the minimum energy of a single quantum of such a wave is h times its frequency; and the mass of the particle is simply that minimum energy divided by c2. If we want to know where the particle’s mass comes from, we need to learn what determines νmin, and why there’s a minimum frequency in the first place. For particles such as electrons and quarks, the full story isn’t known, but the Higgs field plays an important role, as will be discussed in a later series of articles. And so we conclude: The particles of nature are quanta of relativistic quantum fields. The massless ones are quanta of waves in fields that satisfy a Class 0 equation. The ones with mass correspond to fields with a Class 1 equation. There are many more details to investigate. But this fact is among the most fundamental properties of our world. Do These Quanta Really Behave Like Particles? When we think of particles, we think of specks of dust, or grains of sand. Quanta are not particles in this sense; they are waves that, for a given frequency, have minimum energy and amplitude. But they behave so much like particles that we could be forgiven (well, almost forgiven) for using the word “particle” in describing them. Let’s see why. If you make a wave in water, and you allow this wave to pass over some rocks that lie just below the water’s surface, some of the wave will cross over the line and some of it will reflect backward, as in Figure 3. Exactly how much crosses over will depend on the shape of the rocks, how close they are to the surface, etc. But the point is that some of the wave is transmitted across the rocks, and some is reflected. Some of the energy of the wave keeps going in the same direction that it was going initially; some goes back the other way. But if you send a single photon at a piece of glass that is somewhat reflective, that photon either will be transmitted through the glass or it will be reflected (Figure 4.). [More precisely, if you measure what the photon does, then you will find it was either reflected or transmitted; if you don’t measure it, you can’t say what happened. Welcome to the murkiness of quantum mechanics. We will move right along now.] A photon is a quantum; its energy cannot be divided up into a part that went through the glass and a part that reflected back, because then there would be less than a quantum on either side, which isn’t allowed. [Fine point: Glass cannot change the frequency of the photon, and that’s why the energy can’t be shared among two or more quanta with lower frequencies.] So the photon, though it is a wave, behaves quite like a particle in this case; it either bounces off the glass, or it doesn’t. Whether it bounces or not is something that quantum mechanics equations do not predict; they give only the probability for the bounce. But they do predict that no matter what happens, the photon travels as a unit, and retains its identity. What is it like to have two photons? Well, that depends. For example, if the photons were emitted at widely different times and places one will see two individual quanta widely separated in space, and perhaps moving in different directions (Figure 5). They may also have different frequencies (not shown). Alternatively, in the very special case where two photons were emitted together in perfect synchrony (as is done in lasers), then two photons look as shown in Figure 6, which shows that if we send this combination of two photons at a piece of glass, not two but three things can happen: both photons can pass through the glass together; both can be reflected from the glass; or one of them can be reflected and the other transmitted. Either zero, one or two photons bounce off the glass; there is no other option. In this respect, these quanta of light waves again behave like particles, a little like tiny baseballs, because if I threw two balls at a fence with some gaps between the fenceposts, I’d expect zero, one or two of the balls would pass through the gaps, and two, one or zero would bounce back. The option of 1.538 balls bouncing back just doesn’t exist. So yes, it is really true. Quanta behave enough like particles that calling electrons, quarks, neutrinos, photons, gluons, W particles and Higgs particles by the name “particles” isn’t a disastrously misleading thing to do. But the word “quanta” would be better — because that’s really what they are. Quanta of fermion fields and boson fields are different from one another, and the key reason is explained here. More qualitative and less technical comments about the consequences of this difference are discussed here. Here is a list of some of the most important things I haven’t explained, and will try to describe to you at some later time. How fields can interact with each other, and how those interactions allow particles to interact with other fields and particles. ALL field values are certain activity in something …. You called fields as objects …. You never explained the physical identity of the thing that is oscillating and have values in space and time……. Take the electron field for example , when you say that it is an object that vibrates and have values at each point and time….O.K. what is THIS object ? electronness stuff ? Or just we dont know as it is fundamental which cannot be reduced to any thing else ? Scientific knowledge is always incomplete. As far as we currently know from experiment combined with theory, the fields of nature are fundamental objects; the electron field IS the thing, and it isn’t made from anything else, nor does it represent a property of anything else. But it wouldn’t surprise anyone if that perspective were to change. We just don’t have a clear idea of how it would change — there are many possibilities. It is not clear that the way it will change is that we’ll discover these fields have some sort of odd medium; it may be much more subtle than that. ALL field values are “” a measure “” of certain activity in something . Factual sciences like physics describe how things behave, but physics does not attempt to imply why things behave the way they do, or what these things are. In the sense that physics does know far enough to describe a certain behavior of the electromagnetic field, physics can describe that electrons “are” certain type of quanta of the electromagnetic field, but that is not the same as implying that we really know what electrons are. Just like Richard P. Feyman would say, we bearly know enough to say that QM works (and it really works! ), but we really can’t say that we understand QM, as it is really absurd as well as completely counter-intuitive. QM is one of the most (if not THE most) successful theories in the history of science, but as much as it is successful, it is also entirely absurd, which means that nature is as absurd as it can get. As as species, our own survival does not depend on quantum mechanical effects, as our survival depends on the interaction with large enough objects, so, our senses and our “instruments” like our eyes evolved in such a way that we are not aware of QM effects. Our brains have evolved in such a way that we can imagine concepts, ideas and abstractions that can concoct some funny explanations to the funny behaviors detected by instruments in QM experiments. Those funny, absurd explanations are QM equations: they can be absurd, but they can explain those experiments, and they can predict with amazing precision what happens with these things we call quanta. It is this absurdity that made Einstein so upset and uneasy about QM, but even he had to admit to the fact that QM is as successful as any theory can get (just about as successful as his own GR theory is!). I would argue that QM is not absurd at all, but rather our expectations are the problem. We perceive a non-quantum world, and as such our brains are simply not equipped to deal with QM. Humans should not impose our own predilections on nature – the universe is the way it is whether we like it or not. Since QM seems to describe natural processes so perfectly, well… then we simply have to get used to it. Gaston and Harry, I disagree with the idea that nature is absurd and that our brains can’t perceive a quantum world. Nature is never absurd, human conceptions frequently are. Anyone can construct a model that gives accurate calculations that match results, but that doesn’t mean it reflects the true reality. Just recall the the Ptolemaic model of our universe. Please don’t reply that that model wasn’t as accurate as is QM and therefore the QM model is correct. The number of decimal points of accuracy doesn’t matter. The current QM model is very ugly and unsatisfying a “dippy process” to quote Richard Feynman (See Chapter 4, Loose Ends, in his book QED). Some day something better will come along that is more satisfying. This article is full of insights regarding particles as quanta of fields. Prof Strassler has made an important point regarding the two “Pythagorean” relations he has mentioned, and he has implied that somehow, there is a relationship between this and the fact that particles are either bosons or fermions. The quantum mechanical differences between bosons and fermions (difference in behavior as QM particles) cannot be fully explained with a non-relativistic approach to QM. That is why the two “Pythagorean” relations mentioned are so full of insights. I would prefer a new look into the situation by someone not indoctrinated in the old ways, by someone who has a good understanding of the absolute and relative nature of space and time. I like Gaston, comment. Very helpful. I have found the people who are most likely to use the word ” indoctrinated” are the ones who’s scepticism regarding physics theories is anchored in religious beliefs. ironic? One of the things you said you’ll explain later: Why the electron simply cannot have a mass unless there is a Higgs field. Waiting somewhat impatiently for that! If part of what you said is ontological ie. there exist an unknown medium of which fields and particles are the properties , then what would happen to the S.M.mathematical structure ? would it collapse ? if not ; then how can we explain the success of the S.M. without the medium while the medium exists.? – Each quantum field corresponds to a different particle entity (electron, photon, etc.) Concrete “material” particles are waves in this fields. – For massive particles there’s a minimum frequency (non-zero) a wave can have and that is the mass of the particle when it is not moving (in space). For massless particles the minimum frequency is zero. – Waves with different frequencies are particles at different energy levels. In the case of massive particles different energy levels corresponds to different speeds. – For bosons the amplitude give the number of particles in the same wave. Two or more fermions can’t be represented by the same wave. * Each particle is a quantized ripple in a corresponding field; there are some little subtleties here and there, (example: if a type of particle is different from its antiparticle, the particle and antiparticle are two related ripples in the same field) but that’s basically right. *Other than the semantic use of the term “energy levels” (just say “particles with different energies”), correct. * More precisely and technically, two fermions can’t be in exactly the same state, whatever that might be. Regarding your statement here and in other places you refer to light as always traveling at light speed. The problem I have with such statements is that these statements don’t reflect the absolute and relative nature of space and time, and therefore these statements have a very high potential for confusing the reader. It’s as if you mean to communicate that there is only one proper measure for space and time. The speed of light is about 300,000 kilometers per *second*. The second is a measure of time, yet everyone who is familiar with relativity theory understands that time (and space) are relative. Space and time are only absolute within any given inertial reference frame. Yet, there are multitudes of differing inertial reference frames. Everything that has absolute values in a given inertial reference frame has relative values from the perspective of those who are viewing that other frame from their differently moving inertial reference frame. Light should not be singled out as something special. It is the lightest and fastest traveling known quanta. I know of no good reason to treat it as massless just because it is the fastest of the quanta. I think the convention of treating it as massless has to do with the history in physics when physics was confused (and I dare say still is, for why say that a constituent of a particle is heavier that the particle itself simply because it had to be accelerated to very high velocity to find it?) about relativistic mass. Under that old and wrong way of thinking (which you have said that you don’t subscribe to) if something moved at the speed of light it would have an infinite amount of mass if it had any at all. It seems to me that some of these old ways of thinking about the situation are somewhat still existing and just screwing up progress in understanding the physics of our universe. Light happens to travel at c, and is thus has invariant speed with respect to changes in inertial reference frame. Instead the velocity (direction) and frequency change as reference frame changes. The frequency change is seen as redshifting/blueshifting. Vincent- I don’t understand these statements. It makes no sense to say that light is the fastest of the quanta, as though different quanta have different speeds and light happens to be the fastest of the set, as though it were the fastest of a set of cars or airplanes. And any violation of the SO(3,1) symmetry of flat space by the laws of nature would have enormous experimental consequences (such as types of particle decays that we don’t observe). So we know from experiment that SO(3,1) is a symmetry of nature in small regions — that all laws of nature, especially those involving ordinary matter and light, obey it. Your statements simply don’t account for this. This is the risk of putting words first and mathematics second; you make statements that sound nice, but they violate the equations that we use to make predictions. In science, the predictions and experiments come first, and philosophy comes second. Alternatively, in the very special case where two photons were emitted together in perfect synchrony (as is done in lasers), then two photons look as shown in Figure 6, which shows that if we send this combination of two photons at a piece of glass, not two but three things can happen: both photons can pass through the glass together; both can be reflected from the glass; or one of them can be reflected and the other transmitted. Either zero, one or two photons bounce off the glass; there is no other option. But, what other option would there be if the two photons were moving independently towards the glass? For photons moving independently at a piece of glass, isn’t it still true that “not two but three things can happen” and wouldn’t they be the exact same three things that the two laser photons could do? I’m not clear on the difference in behavior for two laser photons at glass and two independent photons near glass because you didn’t discuss the independent photons at glass. Well, I wondered about this animation and the later implications Prof. Strassler made myself and I think the point is that the two identical photons in question don’t actually are two independent waves but a singular one with higher amplitude instead. (After reading a lot of articles here [Thanks, Prof. Strassler! Very informative! ], I thought that would be so and wondered why it wasn’t mentioned, but you can actually observe the different amplitude of the two separate photons after reflection/pass-through wrt. to the original amplitude). Although I recognize the point Marko makes about the identical photons in question, but that’s not the point being made in the text even if shown in the animation. My question has to do with how the text is written and I suspect it should be changed because as written, it implies two photons that are not identical would have something other than the 3 outcomes listed for the identical photons. I don’t see why that would be. I’m guessing (but I have to guess) that the point is that even though the two identical photons at first behave as one particle, in passing through the glass it’s clear they are behaving as two particles. Colin – Yes, you’re right — if you had two independent photons you also have three possible outcomes. I should clarify the text. The point was to emphasize the difference between this case and Figure 3, which shows a classical [i.e. non-quantized] wave. Depending on the details of the obstacle, there are an infinite number of outcomes for Figure 3, whereas no matter what kind of window you put in Figure 6, you only have three possible outcomes. Thanks Matt, this clears up something I had been wondering about. There’s only one type of photon but it can have various wavelengths. I wondered why people never talked about different wavelengths of the electron or other particles? If I understand your series correctly , then different frequencies/wavelengths of electrons just corresponds to the electron’s different velocities (unlike photons where the velocity is the same for all frequencies). So, we can accelerate an electron (using a magnetic field for example) – this causes it to increase in frequency.. is there any analogous procedure for increasing a photon’s frequency? Finally – gluons, being massless, would be Class 0 particles. Is it meaningful to talk about the wavelength of a gluon? Your understanding is perfect. Increasing a photon’s frequency corresponds to increasing its energy – exactly as it does for an electron, since higher velocity means higher energy..
It’s not as easy to make a photon’s frequency increase as an electron’s, because to change its frequency you have to accelerate it, which means you need to pull on it somehow. With electrons, electrical forces are easily able to do the job, and do so dramatically, because the electromagnetic force is reasonably strong. With photons, the only force available is gravity. It works, but because gravity is so weak the effect is subtle. A photon heading from space toward earth will experience a very subtle increase in its frequency, from our point of view. A photon heading into a black hole will experience a much more dramatic effect, from the point of view of someone orbiting the black hole and measuring the photon. Absolutely it is meaningful to talk about the wavelength of a gluon. It is meaningful to talk about the wavelength of any elementary particle; all “particles” are really quanta. If an unknown medium really exists , then correspondence of measurements and mediumless equations is a mystery. If no medium exists then we face the logical impossibility of effect/action in absolute nothingness where by action i include all and any kind of fields known or unknown. The only escape for physics is just to claim : this is the way the world IS , but here we see the fallacy of explaining existence by existence ! Are we really forced to accept this fallacy ? 1) Equations _never_ imply “real” physical/ontological existence. Or it must be by the ink in which they are scribbled down. If something unknown exists, of course there is a mystery. But an order can be found in the universe and described, no matter what that order represents. 3) Is this the same fallacy of how the existence of a field is explained by the existence of a medium? Or as how the existence of the world is explained by the existence of God? I agree, this method by itself does not explain anything. Everyone has to say, at some point or another, that Everything that IS is the way it IS. It is a tautology which can not be avoided. But physics at least, in the conceptual journey from our finite personal experiences towards that pitiful answer, brings along the way understanding of the infinite universe. It does so by describing the multitude of complexity by the simple and elementary, in the language of mathematics, a child of logic. 4) Yes, but the answers physics is giving are simpler than the questions related to them. When the answers can no longer be simpler than the questions, we truly find ourselves in the realm of metaphysics, and one could argue that the end of possible understanding has been reached. But since addition is commutative, shouldn’t I be able to swap around the terms and deduce that pc = hv_min and mc²=hc/λ ? No, because Matt is linking constants with constants, and variables with variables. That is to say, hv_min and mc^2 are constants, determined by the nature of the wave/particle, whereas λ and p are quantities that can be varied. Ignacio- While what you say is true in principle (and notice I did not make my identification of the pieces of the two equations a mathematical derivation — it is just a leap of insight) what James says is the point. To say it another way: The idea is to note *both* equations have minimum energies, and *both* equations have a simple relation that emerges at high energy. To get *both* of those things to match, you have to match both the momentum term and the mass term separately. I am really appreciating the series and am really looking forward to the installment on the interactions among fields. Nature is as it is. Our understanding of nature is not perfect, and it might be the case that we may never get it right, even though the history of the evolution of scientific paradigms (a la Thomas Kuhn) does inform us that it seems as if we get closer to perfect over time. The equations that we use are just an expression of our understanding. So, the perspective of our understanding and of our equations is man’s perspective. From that perspective, ours, nature does express itself as absurd, as it does not seat well with our every day experience. We could argue with Einstein that there are no priviledged reference frames, so, our perspective is just as good as any other perspective, not better than any other perspective, and just as well, not worse than any other perspective. But these comments are not scientific facts, just opinions. Did you just come to this comment section for a pulpit to espose your eloquent but mostly meaningless prose? I don’t have a mathematical education so I get some of what you are saying but not all of it. We might be saying the same things but I’m not sure as I’m unclear about what is meant by “c is the scaling factor to convert between space and time units when calculating the Lorentz scalar distance,…” Your second paragraph seems okay but can be ambiguous with regard to the word “changes.” Do you mean “changes” when there is rocket type acceleration or “changes” when there is no acceleration, just different velocities? To see if we are in agreement let’s change the constant from light to some other motion. Let us imagine a small room in a rocket ship in outer space. In that room is a gun that has bullet shells. The gun is mounted on a gimbal and is in the exact center of a cubic shaped room. We will say the shells have exact loads of powder that produce when fired an exact velocity. Now, when we measure the time from when the bullet leaves the gun to the time it arrives to its target on one of the walls, regardless with which of the walls we point the gun at, we will conclude that there is an absolute constant irrespective of gun pointing direction provided the rocket thrusters are off and the rocket ship is freely moving, i.e., inertial. For that circumstance we have absolute and isotropic space time geometry. Now if we fire the rocket thruster (and thus are no longer inertial) while the gun is pointed opposite the direction of thrust, i.e., the bullet is traveling in the same direction that the rocket is accelerating in, the velocity of the bullet will be less in that direction. It will take longer to reach the target due to the gravity/space-time curvature we have introduced by turning on the rocket thrusters. In this circumstance light will behave the same, i.e., it will be non isotropic in its motion, just like the bullet. Light when directed in the same direction will be slowed just like the bullet. When the bullet or a light beam is directed 90 degrees to the angle of thrust they both will curve down (down being the side where the rocket thruster is). And when the bullet fired from the gun or a light beam is directed towards the firing rocket thruster they will both be speeded up in that direction. If this rocket has accelerated for some time and is now at the speed of light as determined from when it began its acceleration and shuts off its thrusters it will be inertial once again and any motion experiment, whether a bullet fired from a gun or a light initiated within the room will have absolute and isotropic space time geometry once again. Light when initiated and measured from within that room will travel at the speed of 300,000 kilometers per second in any direction. This works this way because the space that we use to measure distance and velocity has transformed to this new reference frame. Such a high velocity rocket ship, if we are not on it, will have left our universe of possible interaction (redshifting itself out of existence). This is similar to the situation of a black hole minus the effects of the spin of the black hole. Vincent — this is profoundly mistaken. Light will be redshifted, but not slowed. And in the other direction, light will be blueshifted, but will not be moving faster. Motion faster than c violates local causality. If what you said were true, light falling to earth in the earth’s constant gravitational field would travel faster than c, by the equivalence principle. Matt, there is no violation of local causality. An observer free-falling in the same gravitational field in the same direction as an incoming light beam will exactly match the increased speed that the photons gain. When *that* observer looks at the speed of that light beam he will measure it to be c (aprox. 300,000 kilometers/sec.). If the free-falling observer has gained 100 feet/sec the light beam will have gained 100 feet per second too by the time they both impact a planet lacking an atmosphere. …for every reference system in which the laws of mechanics are valid, the laws of electrodynamics and optics are also valid. I take from this that light falls and speeds up just like everything else in a gravitational field. That statement is true only when each observer is comparing his own reference frame. His measure of space and time is absolute in his own frame. When an observer looks at a reference frame that is not his own, a frame that is moving differently than his own and consequently has a different measure of space and time, there will be a Doppler effect increasing or decreasing in the energy of the signal, which we all know, depends whether or not the motion is approaching or moving away. That Doppler effect should mean that the signal is moving faster or slower than when it is measured from the reference frame the signal originated in. Light that arrives moving faster or slower will interact with our local medium (atmosphere, windows, etc.) before it arrives to our measuring instruments. After the faster or slower light has interacted with the local medium it will come out from the medium at the local value c but at a different wavelength that corresponds to a higher or lower energy. Do you agree that these comments clarify matters on this point? If not please explain with non mathematical language. Now I wish to direct your attention to the most scholarly book I know of on Einstein’s struggles with his development of a correct relativity theory and his many missteps (most often ignored in other books). That book is ‘Subtle is the Lord…’: The Science and the Life of Albert Einstein, by Abraham Pais. I hope you still have your copy. I am in complete agreement with you , my point is ; if this is the situation then why some scientists deceive the people by presenting perspectives as ontological realities ? …. people build world views upon that claims even ontological belief systems , this is a very dark side of some “” scientists “”…….. shame! kind regards , aabed with respect. Because apart from perspectives, there is still such a thing as reality, and such a thing as consistency. It may be that different perspectives are inconsistent with eachother, unlike reference frames in Einstein’s General Relativity theory. And scientists DO judge perspectives, by testing their consistency with reality. Evil bastards. “A photon is a quantum; its energy cannot be divided up into a part.” ->What does this tell about the propagation of a single photon emitted from a point-like particle (an electron etc.) in vacuum? Does the wave front (packet or energy distribution in space-time) of this single photon propagate in an ever expanding spherical form (like a spherical shell with a finite thickness)? or does it point to a certain direction and propagate? But if the photon is spread out like a sphere (or in a non-point-like volume), how can it act like a (point-like?) particle? You are confusing what a single quantum is or does with a group phenomenon. A single person at a stadium standing up after having been sitting down is not wave front, or statistical energy distribution. Think about it. Vincent — I’m afraid I don’t find your statement clear or even really correct. h bar- You’re about to encounter the murkiness of quantum mechanics here. And so if I have a huge number of atoms, all decaying in similar ways, each one emitting a photon that goes in one particular direction, but the ensemble of photons going in all different directions, all of my photon detectors will go off as though there were a spherical wave. In a similar sense, the radio waves emitted from a radio antenna can be described as forming a nice antenna pattern that go off in all directions — but they are made from photons, each of which (if you measure it) turns out to have gone in only one direction. Meanwhile, you have to be very careful about making statements about what happens in a quantum mechanical world in the *absence* of an actual measurement; that often leads to confusions. Matt, I agree that I could have done better here. I mixed the idea of a beginning of a classical wave (if other stadium fans would participate) with a reference that belongs to quantum mechanics. Mea culpa. Thank you for your explanation. “That photon will go off in a particular direction.” The phenomenon seems somewhat clearer now. Just to make sure:So, this single quantum (a single photon) can “never” radiate (or split into two) or spread out regardless of its travel distance even after propagating a few billion light years in vacuum? Is this correct? But even so, something still seems strange.. for example, if double-slit experiment is conducted with an emitter which radiates a single photon at a time, the interference pattern still shows up, right? If it does show up, where is “a single photon” and its energy localized/distributed while passing through two slits and traveling in vacuum? A single quantum (a photon) passes through both slits without splitting into two? because a quantum and its energy cannot split into two (it is not allowed)!? So, how to make sense of this? A single photon passes only one slit but some kind of wave (probability wave? ?->what on earth is this? does this have energy/direction? is this an intrinsic component/property of a photon? or is this just a calculation tool/concept without physical entity?) still passes both slits at once? or maybe a single photon is not a point-like particle but instead it occupies space in a volume without a definitive boundary while traveling so it can pass both slits at once?? What is the case? The proper interpretation of the double slit experiment is undergoing some review right now. I’d prefer not to answer this too precisely until I fully understand this review. But what is certain is that if you send a single photon at two slits, the photon does not split into two photons. You can do the same experiment with an electron; clearly the electron cannot split into two electrons, because that would violate charge conservation. So no, a single quantum remains always a single quantum. The challenge is to interpret the behavior of the quantum as it passes through a screen with two slits. In quantum mechanics, a probability wave is not a property of a single particle — it is a property of an entire physical system. So it isn’t intrinsic to a photon — it is intrinsic to the universe as a whole… there’s only one probability wave, and it’s an extremely difficult thing to think about. I do not have a good suggestion for how to build proper intuition about probabilities and quantum theory in the absence of mathematics, and until I do, I shouldn’t try to answer your question. This stuff is very subtle! Quantum Mechanics offer some explanation of the double slit experiment, but that explanation is a “first aproximation” kind of explanation, just like QM is a “first aproximation” kind of theory. To be able to have a better and more complete understanding of the double slit experiment, you need to resort to a “more complete” kind of theory, like Quantum Electro Dynamics (QED), but this theory is a lot more complex than QM. With simple concepts, we could argue that there are many possible paths that the electron could go through, and for each possible path, the single electron has a certain probability to “go through” that way. The sum of all the probabilities for all the possible paths is 1 (100%, but expressed in modular of normalized form), and since the probability of each given possible path is not zero (it is small, but not zero), all possible paths could be “travelled” by the single electron. The interference pattern that we see on the screen at the other end of the double slit is an expression of those probabilities of all those possible paths that can be travelled by the single electron. The places with higher probabilities appear “lighter”, while the places with less probability appear “darker”. An electron is not a macroscopic missile, it is a quantum particle. I would appreciate very much if you kindly tell your description of declaring that extra / meta / multi / mega verse IS the proof !!!!! that GOD does not exist ……..
Is this honest discourse ? I challenged some of ” them ” to give just an imagination for a physical mechanism able to generate laws and constants of nature ,i never got a response. No such generator is possible as it needs what it is supposed to generate….so why deceiving simple persons saying that science now can show that GOD does not exist!! Science only deals with the physical , never with the ultimate , …. science can never tell OR prove the existence or non-existence of all that is BEYOND. That is what i meant to say………..
As long as supernatural concepts such as that of a God make no prediction which can be falsified, they indeed fall outside the reach of science. Science can only proof that an idea is inconsistent with physical reality and so false. Scientific “truth” is thus not absolute, but the current state of our solid knowledge. Mathematics on the other hand does have proofs of truths, via logical deduction, but they depend on axioms. Whether one believes in a God is therefore purely a philosophical matter. Professionally, physicists abhor philosophy, because no disagreement can be settled. They prefer an unbiased arbiter like Nature to make progress in our knowledge. But man is curious and to some extend philosophical at heart, scientists included, so we all grasp at the deeper truths of our world. Science does show that our world does not need a God to be described and to be understood, though by sacrificing value some argue. Many prefer the _knowable_ ultimate infinity of the multi/universe to that of the _unknowable_ ultimate infinity of a God (at least this is the case with the Christian God). And are content with only one ultimate infinity, on the principle of absoluteness/completeness. A multiverse surfaces in this approach because given our universe, we can imagine infinitely many alternative ones. “God” is a redundant abstraction for those who do not believe. Of course, the irony is that for those who believe, God is anything but an abstraction. The only one —as far as i know — who states clearly that what we know as per today contains lots of unknowns and so it is not a world view is MATT……..many /all others declare perspectives / speculations as if they are facts !!!!!! SZ. The field cannot be the medium , fields are actions 1- in mediums , 2- in absolute nothingness , the later is absurd , i am not talking about equations , far from it , i mean reality …. Let me give one example ; one of the cosmological hallucinations is the emergent universe model where to “” explain”” some aspects of the model they “”invented “” a new , un-known and un-knowable field , is this the way we reach knowledge , by imaginations ??? ?remember the invented 3476543 axioms of the M-“”theory””? , no , SIR , science is a respectable , firm , sound structure on the condition that it does not mutate to fairy-tales story telling. Well… it is true the field cannot be the medium. The real problem with your statement that “fields are actions 1- in mediums , 2- in absolute nothingness” is that it assumes there is no 3-. Which there might well be. Scientific confusions are often due to limitations of human imagination. It is not even clear what space and time are, and since fields are functions of space and time, the whole question may prove irrelevant or somehow off base. Google “Why Time is Absolute, and Relative, But Never Universal” to find my page giving what I believe is the best view of what space and time is. Or click on my underlined name here and scroll down until you see the link. Well, Matt told you what is meant with a field in physics. But you could find a more formal mathematical description of it if you wished. If your “field” is something completely different, then we can only have a confused discussion. Or play cricket on it. Physics talks about reality in the language of mathematics. The language is important, because it is precise. Yes, we actually reach knowledge by imagination! Apart from the obvious, we do NOT actually know what reality is unless we investigate it. And science vigilantly tests both our sensible and mad ideas, to keep us on the track towards deeper knowledge, but without assurance that the mad will be false. If the Higgs was not found, the Standard Model would have been in trouble. At the end a true scientific theory must be consistent both internally and with reality. By many physicists M-Theory is not yet considered scientific, because sience can not put its teeth into it yet. But there is an ethereal realm between science and nonsense, which is called mathematics, and which has it’s own theories and whose truths, even if isolated islands, transcedent physics. Maybe i was not clear , i am not against searching for reality in its infinite aspects , i am opposing declaring ANY mad hallucination as fact , for ex. , the higgs is based on firm expectations based on a complete structure where something is missing and we called this something H , but when they talk about fairy field called phi in a fairy tale called emergent universe just to claim an eternal universe just to deny GOD ,this is complete and total deception…..this is NOT science any more……how can any one oppose this. ? I AM AGAINST DECEIVING THE SIMPLE PERSONS…….this would be classified as intentional crime. Bah. You seem to ignore what I try telling you altogether. And we’re not going to have a second rate theological argument here a thousand years late (“Why should an eternal universe exclude GOD??”). Bah twice. Denying that GOD exists does not require ANY science whatsoever. If physicists are coming up with crazy theories, it’s for other reasons: they may be crazy, or the universe might be. Bah thrice. Deceiving the simple rabble with mad hallucinations? I can’t think of a better description of what prophets and religions have been doing through the ages. Science and religious beliefs are separate spheres that unfortunately, and to the detriment of both, are often mixed because that is just the way humans are. They like to mix their religious ideas with their science, or not. God is the lazy persons crutch for explaining things. Click on my name here to get another perspective of such things. I think you will find it to be very interesting. I am afraid that the equivalence principle only holds if gravitation and inertia share the same source. As long as we do not know what the source of gravitation truly is, I do not think that we can be sure about the speed of light being invariant. Apart from this it seems more logic to me that if light is not invariant, blueshifted light is slower than redshifted light and not faster. You mention “waves carry energy and information from one place to another”. Do quanta carry one bit of information from one place to another? Hmm… Generally they carry more than a single bit. A single photon could carry momentum and direction (three numbers), approximate time of arrival, and polarization; not so obvious to me how many bits sit in there. Apparently not expected time of arrival. Do you have any recommended further reading particularly on the Class 1 waves? Hmm. Good question. What kind of things do you want to know? Actually, I know you have tried to keep the math out of this… But the math is what really makes this interesting for me. I really want to understand more about the math behind the class 1 waves. I am really regretting never having had a class in Partial Differential Equations right now. I can feel the relationship here between the Schrondinger equation which is what I was only introduced to and what you are showing me with these equations but I feel I am missing some details… It is a totally different approach to what as electrical engineer I thought I understood in Electromagnetics but now I see some greater generalities to what I was taught. I want to understand more. The way I read your post, you are simply trying to define the words particle and wave as synonyms. There’s no physics here, just an English language issue. What am I missing? Our goal is to understand what the things we call “particles” such as electrons, photons, quarks, gluons and neutrinos, actually are. This sentence makes clear that things that you call particles are not particles; you just decided to call them particles. Does it matter what you call them? In terms of science, No. E = pc is Einstein relation for massless particles. This sentence really reads: E=pc is Einstein’s definition for massless waves. And what is mass? You defined mass as m=(h/c2) v_min. Mass is defined as frequency. In fact, density is proportional to frequency squared, not mass. But that’s another story. So, your sentence really reads: E=pc is Einstein’s definition for frequenceless waves. If we want to know where the particle’s mass comes from, we need to learn what determines v_min, and why there is a minimum frequency in the first place. If we want to know where the wave’s frequency comes from we need to learn what determines its minimum frequency and why there is a minimum frequency in the first place. Your problem has nothing to do with particles and mass but it is about waves and the frequency of waves. Again you unequivocally stated that electrons and quarks are waves. Why are you now calling them particles? It is hard to understand this. Do you agree that electrons and quarks are waves? You said so yourself. What have you to lose if you admit that a wave is a wave? The particles of nature are quanta of relativistic quantum fields. Because you defined both particle and quanta to mean waves. this sentence really reads: The waves of nature are waves of relativistic wave fields. The massless ones are quanta of waves in fields that satisfy a Class 0 equation. The ones with mass correspond to fields with a Class 1 equation. This sentence really reads: The waves without frequency are packets of waves in fields that satisfy a Class 0 equation. The waves with frequency correspond to fields with a Class 1 equation. In this sentence now you decided to use the word particle to mean spherical balls. And you are asking if these waves really behave like spherical balls. I note that the discoverers of what you call waves today like neutrino and electron considered them to be spherical balls having properties of balls not properties of waves. When we think of particles we think specks of dust, or grains of sand. Now you are saying that the word particle means particle. You say that a particle is not a wave, but a particle. The word particle does not mean wave. I agree. Quanta are not particles in this sense. You don’t need to say “in this sense.” Your quanta are waves, and waves are not particles. This has nothing to do with physics. This is a simple question of proper usage of the English language. Particles and waves are two words that refer to things that are totally different things. Quanta are waves that for a given frequency have minimum energy and amplitude. No matter what you call it, what is observed are waves. You may call them quanta, or particles, or ducks or geese or whatever you wish but you cannot change the fact that what is observed is waves. But they behave so much like particles that we could be forgiven (well, almost forgiven) for using the word “particle” in describing them. The correct version is: But these waves behave so much like spherical balls that we can call them “particles” to describe these waves which are not particles but apparently behave like particles. You said it again: these waves are waves, they are not particles. You say explicitly, without a doubt, that you are dealing with waves but that you decided to call waves particles. Then you give an example of a photon that bounces off the glass or doesn’t. As you say again and again, photon is a wave. How it bounces of a glass does not turn it into a spherical ball. Instead of choosing the easy way out and calling photon a particle you need to find a good explanation why a wave bounces of a glass the way it does. Remember a photon is a wave. You cannot change this fact by calling it a particle. This brings the most important question of why it is so important for you to call waves particles. The answer that comes to mind is that, you have been calling yourself a particle physicist. But you are in fact a wave physicist; you are studying waves not particles. Instead of admitting this fact, you want to call waves particles so that you can keep your traditional professional title. This is not a scientific behavior. 1. There is no matter in the form of indivisible elementary units of absolute impenetrable surface. 2. There are only waves and some of these waves exhibit characteristics of indivisible units. 3. Physicists decided to call waves particles in order not to change their professional title from particle physicists to ripple physicists. Definition: geese flying in V formation is a bird. Therefore, we are justified to claim that we have discovered a new species of bird. A flying V formation is not a bird, it is a combination of birds; but it behaves so much like a bird that we could be forgiven (well, almost forgiven) for using the word “bird” to describe a flying V formation. But we will never be forgiven by history for corrupting clear scientific terms for academic and political reasons. A scientist has an obligation to call a wave a wave. Otherwise, what is being done is not science but something else. What am I missing here? Why are so afraid to call a wave a wave? A wave is an undulation of something material. Something material that is perfectly uniform (lacking undulations) in space and time, i.e., no changes, has no ability to convey information and transfer energy/momentum; such a universe would be equivalent to nothing. Existence requires relative motion and motion requires something that is different than nothing. What is an essential characteristic to make something different than nothing? Answer: inertia and separateness, i.e., particles. A wave is a secondary characteristic of matter in relative motion. A wave can not be a primary foundational epistemological entity. It seems that the most logical conception is that waves are the result of a multitude of many motions of entities that have inertia. I currently believe that inertia is not something to be explained by something else. It just is. If you think the foundation of existence is based on waves being primary then aren’t you redefining waves to make them a primary rather than a secondary feature of existence when every dictionary definition will define a wave as a secondary feature? And therefore aren’t you doing the same dastardly thing you have been accusing physicists of doing? “I currently believe that inertia is not something to be explained,,,,,. It just is”. What are your current believes with regard to gravitation and the equivalence principle? “Since we don’t really know what causes gravity (except to say most likely it is the result of an induced imbalance of a microcosm of impinging bodies that have inertia) we should keep an open mind that maybe that radiation has something to do with the phenomenon of gravitation. Space-time curvature: in his STR Einstein states “A curvature of rays of light can only take place when the velocity of propagation of light varies with position”. GTR’s space-time curvature makes it possible for the velocity of propagation of light to be constant. Equivalence principle: I do not think that this principle can be based on the consequences of two principally different processes.The gravitational experience one has standing on the Earth is the result of an endogenous process. The pseudo-gravitational experience one has in an accelerating rocket is the result of an exogenous process. The equivalence principle only holds if and when gravitation, acceleration and inertia share the same endogenous “driver”. Sorry, maybe my comment was not clear. I am not making any epistemological statement myself. I’m just trying to understand Prof. Strassler’s post. All the things that physicists call particles, in essence, turn out to be waves, according to this post. But instead of calling them waves, we are told that they are “colloquially” particles. Why not call waves waves? Other than this question, I am not making any epistemological statements about anything. I have been extremely clear. What we call particles are actually quanta. Quanta are waves of minimal amplitude. They behave like colloquial notions of particles, but they are not like specks of dust. It is very common that a word gets a shifting usage over time due to shifts in knowledge. We have no choice but to deal with it. Matt I see you’ve been busy. A while ago I asked this question and I would like your help in clearing up my confusion. In your opinion are “continual spontaneous quantum field disturbances,” “quantum fluctuations,” “zero-point energy,” and “virtual particle/antiparticle annihilation,” different words for the same phenomenon or are they different phenomena? If they are different phenomena what are the differences? Thanks again for making many things more understandable. So is the wave-particle essentially resolved by QFT? In that scientist have a consistent description of nature without having to choose between particle or wave descriptions to explain particular experimental results. I seem to remember a quote from Richard Feynman saying something a long the lines of – the wave particle duality was resolved a long time ago but a lot of people seem to know that – I can’t seem to find the quote now. I assumed he was talking about QFT but maybe he just meant regular QM. It seems physicists debated the wave-particle duality a lot in the early years of the last century ( along with aether and such things ) but have moved on a long way since. Of course no reason why we are not ready for yet another conceptual upheaval. I would perhaps say that wave-particle duality is reconceptualized in quantum field theory. Some issues are resolved. But the core subtleties of quantum mechanics — the theory giving probabilistic predictions, while measurements come out always one way or another — remain. This isn’t a very satisfying situation and we may hope someday for greater clarity. If the things that you call particles are really quanta, then this sentence would be more correct if it were written as: Quanta behave enough like particles that calling electrons, quarks, neutrinos, photons, gluons and W [quanta] and Higgs [quanta] by the name of “particles” isn’t a disastrously misleading thing to do. But the word “quanta” would be better — because that’s really what they are. Prof. Strasser, you mentioned above, that “The proper interpretation of the double slit experiment is undergoing some review right now. I’d prefer not to answer this too precisely until I fully understand this review.”. I’m intrigued to know what you’re referring to. Could you perhaps provide a reference? Please, let me somewhat further elaborate on the question of ‘h bar’! 2. A single quantum moves in a specific (though, unknown) direction, which can be described by probabilistic terms (a set of probable paths). We may determine the position it started from, and the position it was detected (=consumed? ), as with the double-slit experiment. However, in the middle it behaves weirdly. We don’t know if it travels by all trajectories at once (not possible for a charged electron), or by a single one. We only know, that the probabilty to detect it at some position depends on a collection of possible paths, leading to that position. Is that true? 1. no — it is not a single crest and single trough. This is explained somewhere earlier in the articles. In general a particle is a ripple with many crests and troughs; its amplitude, relative to its overall length, is what tells you that it is a single particle. You’re right, the term ‘trajectory’ is completely inapplicable here. What about the term ‘direction’? You wrote: “photon will go off in a particular direction”. The photon is a quanta, a wave of a smallest (for a given frequency) energy (correct?) or a wave of a smallest amplitude and such ‘overall length’ that it gives minimum energy (correct?). But the intensity of the field in one point should influence the intensity of all it neighbors, that’s the intuition for Huygens principle. How can that fit the photon going in a particular direction? Perhaps we should read “photon will go off in a particular direction” as “photon could be detected/consumed from any side of the emittor *as if* it went in a single specific direction”? Your answer “probability-wave that describes what the photon may do” also evades me, it should probably mean “probability-wave that describes our chances of meeting/consuming photon at a specific location”. Let’s suppose a ball, slipping from a top of a symmetric conical mountain. Even though it will eventually slip and move in a random but specific straight line, we could also define a probability field of meeting it at some location. However, not a single physical phenomenae will depend on this field’s values in two distinct points, right? Because even though the ball *may* slip in any direction, it *will* slip in a single specific one. There could be no diffraction on the obstacles the ball may encounter. With a quantum particle like photon, the probability of meeting it somewhere strangely and surprisingly depends on multiple other probabilities, otherwise there would be no pattern in a double slit experiment, right? The pattern is already defined by a single photon, not by the statistics of the collection of photons. The question of ‘h bar’ of “A single quantum (a photon) passes through both slits or one?” in this case is no more appripriate, that my question on the trajectory, right? If we close both slits with detectors, only one may capture a photon, right? I do not mention ‘undestructive detectors’, if indeed they are possible with uncertainty principle. Anyway, an intuition of a photon as a ‘grain’ which is doomed to enter one slit, is evidently false. I see it this way now: the location of photon capture depends not on the exact location of photon when it goes though the slit (or slits), but on the probabilities of meeting photon at both slits. Am I closer to the understanding now? “Direction” can make sense — for a train of ocean waves headed toward a beach, location (and therefore trajectory) doesn’t make sense, since the waves are spread out perpendicular to its direction of motion, but direction of motion certainly makes sense. The equations for a field like the electric field (in which the photon is a wave) are 2nd-order — i.e., what determines how a photon moves is not only (a) what the field is doing now but also (b) how the field is changing. You cannot tell from a single snapshot of such a wave whether it is moving right or left; it takes two snapshots close together in time. You’re statement “the intensity of the field in one point should influence the intensity of all it neighbors” implicitly includes (a) — a single snapshot — but not (b). Similarly, if you take a single snapshot of a ball under oscillation at one particular moment, you cannot tell whether it is moving inward or outward from the point of equilibrium. You need a second snapshot a moment later. that is a slightly better formulation, yes; language is tricky in these contexts. You have to really specify what you’re doing before you try to talk about it. This is close… one has to understand however that (a) it is the probability of capture at a particular location which depends on what’s going on at the two slits — the location is still not determined no matter what happens at the slits — and (b) the term “the probabilities of meeting photon at both slits” is not accurate, because it is not probabilities but something more subtle (the wave function for the system, from which probabilities are derived) which determines later probabilities of capture. This at least is the standard interpretation of quantum mechanics. No one disagrees about the math, but they do disagree about how one should think about it — so in the end you should understand this way of thinking is potentially provisional. What is clear is that photons make an interference pattern in the double slit experiment even if you only send them in one at a time — so they are interfering with themselves. The same is true of electrons: watch the video at http://www.hitachi.com/rd/research/em/doubleslit.html . Thank you, I’m almost content :). As long as you mentioned electron – I wonder what we should see, if we put the facinating double-slit experiment into a gas chamber? Can we really be sure that they are truly interfering with themselves just because we created an experiment that produces an interference pattern? I would like to leave my mind open to the possibility that there is something going on with the path of the electron or photon with regard to the environmental conditions that produces the observed result. What if I came up with a macro world example of what looks like an interference pattern that doesn’t involve one thing interfering with itself? Vincent — I am providing the most common interpretation here, with the caveat that all the interpretations have problems. Since the question of how best to think about this is open, you are welcome to keep your mind open to other options. But on this website I feel my role is to provide the mainstream point of view — for even if one then wants to disagree with the mainstream viewpoint, it is important to know what that viewpoint is. Thanks for clarifying again that what you are providing is the mainstream point of view. Being that all matter has resonance modes and is in states of oscillation, most likely due to impacts from a microcosm of entities with inertia, and that macro-sized particles, i.e., sand, salt, glass beads, etc., when vibrated on a plate produce wave-like patterns due to resonance nodes of the plate and vibration frequency, therefore it is reasonable to conclude that the wave-like aspects of light, electrons, and other matter, and the interference effects of single and double-slit experiments, is due to the fact of vibration/oscillation and resonance of matter. Therefore, I believe it is incorrect to conclude that a single photon, electron, etc., interacts with itself to produce that observed interference patterns in double-slit experiments. Both the thing being projected through the slits and the slits are in vibrational motion after-all, a fact not frequently thought of or mentioned in the historical overviews of the subject. Quantum interference effects also occur in non-wave-like settings, for example in simple two-state systems of a particle with spin, and in quantum field theory, where the interference is of fields in field space, not of particles in three-dimensional space. I do not think you can get rid of the problems of quantum physics by simply postulating vibrating matter in three-dimensional physical space; it will not allow you to cover all of the cases where these issues arise. I am not opposed to quantum interference effects. I consider them to be essential. It is some of the interpretations that bother me. I would like it if physicists looked at these two-slit and other quantum interference effects with fresh eyes from the perspective of discrete space-occupying entities possessing inertia in a universe of interactions that result in many kinds of wave actions, spins, fissions and fusions. I think the chicken and egg question of what is more fundamental, the particle or the wave, is best resolved with the particle because with *particle* inertia can be localized to it and that separates and distinguishes it from emptier space, which is essential for motion to be distinguishable. Motion is not distinguishable in an empty or full universe or in a universe where everything is in the same state of motion. If wave is the most fundamental then it is harder to envision the localization of inertia. While wave does have an ontological* existence aspect in the sense that there is no sound to my ear until a higher of lower pressure hits my ears; this is just a differential effect that is baseless unless inertia of the surrounding formerly static** medium is taken to be an *a priori*. I think this is an adequate analogy for all levels of existence. * By this I mean a wave can in many cases be thought of as a fundamental first cause to an observation. ** Static in only an approximate random sense. You are free to think whatever you like, at least in this country. But I would take the point of view that (provisionally, until something supplants it) data and quantum field theory settle the issue: there are quantum field theories that do not have particles, and you simply cannot write them down using particle states (more precisely, you can do it mathematically, but the “particles” you would use cannot be isolated and observed in any experiment.) So the field is the more basic ingredient; it’s not a chicken and egg issue. You may not like it that inertia isn’t localized, but nature — data, which agrees with quantum field theory, and not with quantum mechanics — says that it is not. So if the field is currently considered to be the basic ingredient and inertia isn’t currently considered to be localized then what of the location of the inertia? Where are we to consider the inertia to be located? Have any of your students ever been so brash to ask this? Or is this an ignorant question? If inertia is not localized is it spread out? Hmm. I think my students typically wouldn’t think this was a relevant question. They’d probably have trouble understanding why you think this is such an important point. Consider, for example, a world consisting only of gravity coupled to electromagnetism, described using an effective quantum field theory. So the only particles are gravitons and photons, all of which are massless. This is not to say that there are no massive objects. Black holes, for instance, can be formed from gravitons, photons, or both being brought together with sufficient energy. These objects of course have a definite mass and a definite size — the Schwarzschild radius. Their inertia is simply the energy of the objects that formed them, divided by c^2. So — in such a world I don’t even see how your question makes sense. The particles in this world are massless, and carry no inertia. The massive objects are composite, and obviously have a size, and so their inertia is spread out. There are no arbitrarily-localizable objects that have inertia, so clearly inertia, in this world, is not localized. And therefore it is not logically necessary, it seems to me, that inertia be localized. In general in quantum field theory, inertia is simply the energy of a quantum at rest, divided by c^2, and a quantum, being a wave, is usually spread out, so its energy and its inertia are also, usually, spread out. That said, the issue of localization only becomes important when you do a measurement that is sensitive to whether it is localized, so most of the time, this question is moot. I don’t know how you can make sure conclusions based on an unreal world (only gravity and electromagnetism) or how you (and the physics community?) believe that electromagnetism carries no inertia. Ever hear of a solar sail to propel a spacecraft? Or comet tails that point away from the Sun? Of course you have, but the physics community changes the nomenclature for light speed phenomena and says that light quanta has momentum but no mass or if they are more careful they say no rest mass. But such dodgy language shouldn’t change the result that if something has momentum that it also has mass. From what I can tell the only reason for the historical convention of treating light speed phenomena as massless is that if it was thought of as having any mass at all it would have an infinite amount due to the application of the inappropriately applied and hence invalid *E=mc²* formula. Unlike big things a quantum of light can not be grabbed a hold of and placed on a scale and weighed. Yet photons, as well as all other real things, do have inertia/mass. We should recognize this because they can move other matter. This seems so self evident to me that it has been a huge puzzlement why the physics community has been so wrongheaded about this. Also a light quanta at rest wouldn’t be observable in any kind of sense; there would be no interactive energy impact to the frame of reference that would be at relative rest to it. Note that photons that might exist at a Schwarzschild radius of an ultra dense non spinning object (black hole) when emitted in our direction would be at rest relative to our normal frame of reference as well as those emitted by a source moving at light speed away from us. The reason that light only seems to move at one speed despite leaving from one differently moving reference frame to another, i.e., there is relative velocity between the two, is because the faster (if emitter is approaching) or slower (if emitter is moving away) photons don’t arrive to our measuring instrument unaffected by our local medium, which could be an atmosphere or lens, et cetera. Those photons will be blueshifted or redshifted when finally received and they will depart the atoms of the local medium at the usual value of the speed of light similarly to when light has to travel through a dense medium like glass. The progress of light is slowed down because of all the interactions while traveling through a denser medium, but once it exits it resumes its normal velocity. For more details about these issues and an explanation about the absolute and relative nature of time and space please see my updated online essay “Why Time is Absolute and Relative But Never Universal.” Clicking on my underlined name at the beginning of this post will take you directly there. Also, we have had similar conversations before at different places on this science blog and for those who are interested google “Vincent Sauvé Of Particular Significance” to find them. One more point: Regarding your previous reply you say that fields [not particles] are the most basic ingredient. As I have said before there are instances in nature where fields and wave phenomena are the representation of the phenomenon that we experience. Example: We can notice wave ripples in a pond that interact as they pass *through* each other. But beyond this phenomenology is a level where the particles that possess the actual inertia bunch up when something agitates the water forcing the water at the surface to bulge up. If it weren’t for a substratum of particles that already have properties of inertia and a structure that says — I’ll keep this space to myself, — wave actions couldn’t happen. And then there’s Rutherford’s 1911 discovery that the atom consists of hard little bits at its core and subsequent particle experiments that seem to strongly imply that matters basic configuration is of tiny bit particles that possess inertia and that when colliding these tiny bits together we get — not waves passing through each other with ripples in their wake — but scattering just as one expects from the view that particles would be the basic ingredient. As usual, we’re talking at cross-purposes; I didn’t understand what you meant, and you didn’t understand my reply. We would do better to communicate more precisely about smaller things than to spend lots and lots of real estate talking about big ideas and simply not talking about the same thing, which seems to happen every time we discuss anything. I’m sorry, but I can only devote a finite amount of time to discussing things with any one person… especially someone like yourself who is not the target audience of this website. The longer your messages and the more detail they go into, the less likely I can reply. And if you want to view the lack of a reply as an indication that I don’t know what to say, that’s up to you. Now I’m going to go answer the questions of other people. I won’t question your rational about not getting into this further. I’m glad you have decided not to because I wanted this previous post to be my last one. This area of science discussion has been pulling me away from the other readings I have been wanting to finish (and other great books I have and haven’t yet started). I’ve been reading Paradox Lost: Images of the Quantum by Philip R. Wallace; Teaching What *Really* Happened: How to Avoid the Tyranny of Textbooks & Get Students *Excited* About Doing History by James W. Loewen (Author of *Lies My Teacher Told Me* — A great book I read years ago); and a library book that is due soon: A Planet of Viruses by Carl Zimmer which is a wonderful read and very fascinating. I want to thank you for the opportunity to have these conversations that we have been involved in. I have found them to be very valuable and helpful for the public and especially myself. They have allowed me to focus and practice my skills at thinking and writing composition — certainly a good thing. I’m wishing you the best with your future. Good luck to you as well, Vincent. It has been interesting, but a bit frustrating not to be able to take the time to define terms carefully and make sure we’re talking about the same thing — it always seems we are not. I’m convinced you’re wrong about these issues (especially in questioning why physicists think photons are essentially massless, and other very basic physics issues), but I understand your thinking has an internal logic, and because our language is different I’ve never quite followed it (and I don’t think you’ve followed mine either). Perhaps someday we will meet and some of these uncrossable chasms can be bridged. Thanks Prof Strassler for the articles. They are wonderful to read–just the right level for me! I have not found anything as good on the web. I appreciate the precision of your language. I have a few old physics books, and sometimes I think they are not written with enough care. Thank you for this site. I found you via reddit, in a tangent thread off a completely unrelated topic and I’ve been looking for something like this for a long time. I’m able to work through most of what you’ve written here, but these waves and fields are giving me a real problem and I think you can easily help. I was never brilliant at mathematics, but I can follow along when I know how to read it. I know you’ve been careful to introduce each new symbol as you go along, but when I come back to read the next article after a healthy break, I tend to forget and spend time either trying to work backwards to get it or find the original article where you mentioned what “v” stands for. Is it possible you could append the math-heavy portions of the site with a key for quick reference? Learning so many new concepts is tough enough; without using these values every day it’s not easy to keep track of them. Granted, I read and re-read until I “get it,” as best I can, but understanding the mathematics is, as I understand, the real meat and potatoes. I love that you’re offering a sample platter here, but it might help a lot of us to have menus on the page when we’re not quite sure what we’re eating. Your goal is to explain the most complicated field in all of physics to the layman, and you’re doing a great job. I know now with more certainty what it is I certainly don’t know; please continue to help with this incredible project. All generators have a source in this world. What makes any of you think that the energy we experience everyday everywhere does not have a source? Scientists call waves a phenomenon that vibrate in a medium because you don’t want to call it God. But what kind of generator/being is it then that is vibrating the sun for an eternity? How are we vibrating at all without a source for our energy? A constant source, because food is not intelligent enough to create us, especially since it has already been plucked from the ground before we eat it. The consciousness within it has already left it by the time we eat it. It has to be conscious to grow because it has a pattern and moves toward it. What causes energy to have a pattern if it is not consciousness? It has been proven over and over that everything has a frequency. Only waves have frequency. Particles are wave packets. Within them are measureable waves. The measure is of a frequency.How can a particle be a particle without a wave? It can’t. So why not say that there is a conscious being looking like a spider’s web that has a center and is constantly waving outwards all of its consciousness in the form of waves, electromagnetic waves? Which we then take as conscious energy beings and turn into wave packets with our observation/our ideas. We take these waves and look a them and through the process of observation they become a particle/a wave packet. I remember reading about men that have won Nobel Prizes for their work in quantum physics. They say that the act of observation changes the wave to a particle or a wave packet. Solidity is a wave packet of condensed waves. Solidity is set of frequencies able to be measured. Solidity is an illusion. It is not weird to me at all. I can see the net or grid configuration that is called non locality. It is a grid of conscious waves that interfere with each other like in the spider web analogy. The interference patterns of these waves cause the web to be one energy, to act as one. I read what Bohm and Bohr and Direc said about our reality. When they watched these quanta in plasmas, their behavior was as if they were one being. They moved as one. If all of you think that there is not a ONEness between us, then you might as well take back all of those Nobel awards with all those principles because you are calling these physicists liars. People are 100% full of quanta. At the core of atoms are quanta and quarks and strings. All of these are vibrating and oscillating. People are energy beings full of quarks and electrons and strings. Everything everywhere is vibrating quarks and quanta and strings and atoms. People constantly wave outwards from all of their electrons electromagnetic energy waves just like the sun. All of these interfere with each other causing ONEness. The way I look at it, people are grossly misled by being called solid when they are not. People think that they are solid and then they live their whole lives afraid of death. This causes untold misery. Because people believe they are solid, they can’t see how they are related with other people. Then they start wars with people that they don’t believe they are ONE energy with. Then they build prisons to house people that are so stressed out because they don’t believe that they are ONE with anybody. Why not murder or steal from people that you are not ONE with? I live everyday to teach that human beings are not solid and do have a source, the same source that is constantly creating the sun with its energy. All people are being vibrated by the same source. Constantly. No matter how much math you have, you do not have a factory that puts together these waves that change with observation that creates wave packets called particles. When you are able to build from scratch the medium, that big fat phenomenon that you ignore and call physical that waves vibrate out from and within, then call me. Either way, I will continue to heal myself instantaneously with my beliefs in a perfect vibrating eternal God/Source of my constant energy. You can believe anything you want. It’s a free country. Physicists, meanwhile, will actually DO things with what they know. It’s not an accident that lasers and transistors and GPS devices and all sorts of other technology were invented by people who understand energy the way physicists do, and not by people who understand energy the way you do. Prof. Matt my doubt is about light/wave interference and its correlate energy. I have read all the posts about waves and I didn’t find any reference about wave interference. Here I have found some explanation about “quanta” reflection or transmission. Since you mentioned that there is no dumb questions and the goal of the site is to be clear to the public, I would like to ask you a question that is bothering me and I dont know how to explain. If two waves meet at a point and from there we have a completely destructive interference, what happen with original energy that was transported (contained) by each wave ? In other way, Could we reflect light in a phase difference of 180 degrees in such way that light will disappear ? In such case what will happen with energy ? If everything is a composition of fields then can equations of motion be used to formulate the mechanism(s) for the creation of heavier and heavier atoms? If the simplest space is a vacuum with only one field in it could that concept be used to say a black hole is heaviest a “space” can get, i.e. not the highest density but a structured space that tends to higher and higher density because the speeds are so high (inside the event horizon) that “normal” time does not allow this trapped energy to escape? If particles are waves in their respective fields, what property of the wave is associated with electric charge? Do you have an article regarding how spin is modeled by QFT? 1. From your knowledge and of the insights at LHC do you (consensus) believe the time variable in Schrodinger’s equation is equivalent to the time variable in the energy-time uncertainty principle? 2. Are they both at the same scale? 3. Could the fundamental interval of change of state being varying and effect absolute time? 4. Could we rehash the equations without the time variable? Say use velocities ratios instead, would that then allow us to dwell below Planck’s scale? Hey Prof Strassler, thank you so much for your series of articles hear they’re very enlightening even to a layman who likes to research everything big and small with our universe. I have you bookmark and eagerly await your new articles! I’ve read most of your basic particle physics articles here on this site, yet the difference between particles and antiparticles is not clear to me. Any relativistic field has particles and antiparticles (for bosons like photons they are the same). A particle is quanta, a smallest (for given frequency) ripple in that field. An antiparticle is also a smallest quanta in the same field. How can we tell them apart? If we could see the quanta-wavelet that corresponds to a particle, how would the quanta-wavelet of an antiparticle look like? Just again, thank you very much for all you do with these articles. In your examples of photons encountering glass, you mention only the possibilities of full transmission and full reflection, but there is another possibility — full absorption, which is where we get the collapse of the photon wave. Sorry for going off topic, but I have long wondered why some physicists are dismissive of wave collapse, as though it were not even a real phenomenon, when it is obviously going on all the time, so to speak. (I even heard Lawrence Krauss claim that quantum mechanics is completely deterministic.) I have also wondered why I have read from time to time that no one knows what causes wave collapse, yet there must be huge amounts of information about what causes wave collapse based on experiments that lead to absorption of quanta. As I have not read the array of comments, my question may be redundant – if so, just say so. I am a lay physicist in the sense that in the 1950’s I got a bachelor’s degree in it with Richtmeyer, Kennard and Lauritson measuring the depth of my education. With that background I have little problem accepting the quantum particle description of the electron (and other fermions) but am at a total loss with the photon (better described as a phantom). With an electron there are “observations” of particle-like properties: mass, charge, magnetic moment. further there are observations of evidence of particle-like tracks as in cloud and bubble chambers. And as you point out, we use the count of electron particles as in our models of the periodic table. So my question: other than the discrete energy effects observed when a photon ceases to exist, what other particle-like “observations” are possible for the photon (and other bosons)?